When you book me as your Wedding Reception for your reception, the P.A. System (Sound System) cost is already included in your quoted price. The P.A. Hire is for an additional P.A. 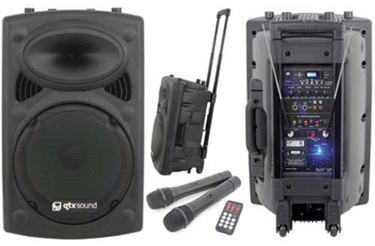 system which is available for when you require two sound systems at the same venue. If your wedding ceremony is at the same location as your wedding reception then, this option could be for you. I have an additional battery powered P.A. system available for use at either indoor or outdoor weddings e.g. a park or garden wedding ceremony location or a Cocktail Wedding Reception. So, you can even supply your own music selection on CD, USB, SD Card or iPod.